Hi all! Have you been "Booed" yet? A dear friend left a surprise for me on my front door. It was a Boo Bag filled with adorable Halloween fun and a challenge. I was to spread the fun to two other friends. Challenge accepted! I had fun gathering things for the bag. I made a sparkling raven and a sparkling pumpkin hanging decoration, got candy, purple and black nail polish and black striped straws. I really wanted to add some Halloween cards to give my recipients a hint of who gave them the Boo Bag. Silver foil and black card stock = wow! I had not used my Minc Machine in a while and I had this idea that you could print on black paper. 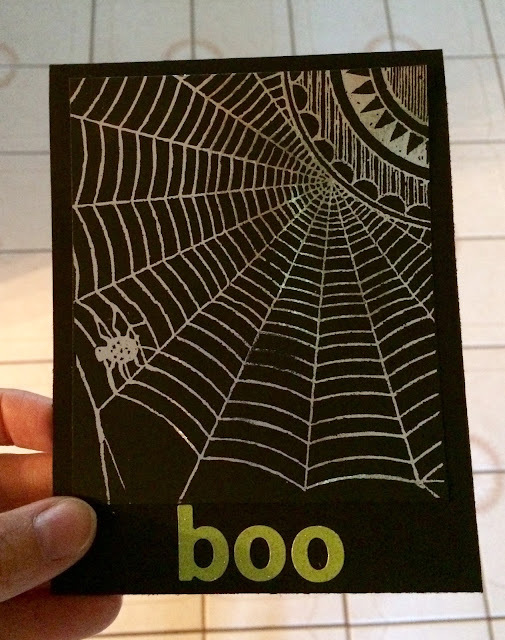 I used some Black Cat Core card stock and put a little white paint pen dot on the top of one side at the top. I was worried I couldn't see the toner on black paper. 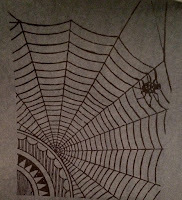 While my paint dried I used my Art Deco Spiderweb Downloadable. If you would like to know how to work with these inexpensive digital stamps, you can find more info here. I also made two card sized black rectangles. Making a black rectangle and photobombing my own picture. I was surprised how easy it was to see the toner on black paper. I would recommend putting a white paint dot on top if you are using a different paper than I did. 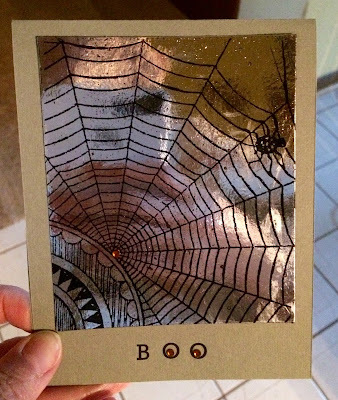 I cut out the web, put silver foil on top and ran it through my Minc. More black card stock and apple green Sassafras stickers make a classy card. I saw on a video that Jennifer McGuire (http://www.jennifermcguireink.com) did a while back that you could use the leftover foil if you put it on a rectangle of black toner. I just filled a box with black. I thought it was pretty easy. I laid the leftover foil on it put it through the Minc machine. The card is so shiny, if you look very carefully you can make out my vertical morning hair. I put this card on some leftover gray paper I have. Used some rub on letters to spell 'Boo" and some orange gems to make eyes. This technique is easy. 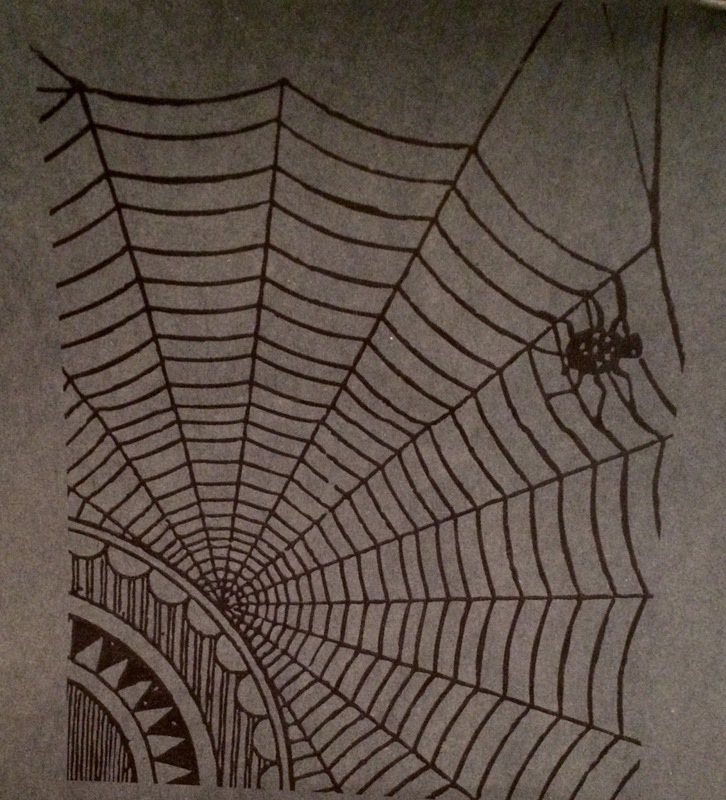 And it is inexpensive because you can use your spiderweb as many times as you like. Materials: All materials either come from my little Etsy shop www.etsy.com/shop/PinkBunkadoo or Amazon where I buy most of my supplies. Amazon is an affiliate link.